On April 17th, the Cheech and Chong Up in Smoke tour featuring WAR is coming to the Fillmore Auditorium in Denver, Colorado. Tickets go on sale this Saturday at 10AM local time via the ticket link above. (BeBevCo), a developer, manufacturer and marketer of relaxation and energy products, is pleased to announce that its subsidiary, Relaxation Solutions, Inc. (RSI), has secured a multi-year licensing agreement to brand its new-to-market line of Relaxation Ice Cream utilizing powerhouse icons, Cheech and Chong, and their classic movie," Cheech & Chong's Nice Dreams" for a branding opportunity never before seen in this market space. The hemp and supplement-infused frozen treats will come in two appropriately named flavors: Chillin' Chocolate(TM) and Groovy Vanilla(TM). Under the licensing agreement, RSI will launch 'Nice Dreams', a delicious relaxation ice cream named after the blockbuster duo's 1981 hit film. Brian Weber, CEO of BeBevCo, opined, "What could be a better example of what we are doing than a film about two enterprising young men who make an amazing amount of money selling ice cream. And that's exactly what we plan to do with Cheech and Chong's Nice Dreams Relaxation Ice Cream." "I'm sure many would agree that Cheech and Chong were pioneers in alternative relaxation methods. What better ambassadors are there to bring relaxation frozen treats to the forefront of the consumer mind than these two popular characters." Company executives are confident that creative licensing launched with the flagship brand, Cheech and Chong's Nice Dreams Relaxation Ice Cream, will impact RSI similarly to Ben & Jerry's of Relaxation Frozen Treats. Ben & Jerry's is at $132 million in annual sales as of April 4, 2012, according to StatisticBrain.com. Medical Marijuana markets. "Prospective buyers have already proclaimed this as a brilliant play in an ever-growing sector," adds Weber. "I'm sanguine with the opportunity this provides us as a top contender in global markets in taking BeBevCo and its subsidiaries to the next level." Several other executive and distribution announcements will be made in the very near future. Like Cheech and Chong Ice Cream on Facebook, by clicking here. Like BeBevCo on Facebook, by visiting here. 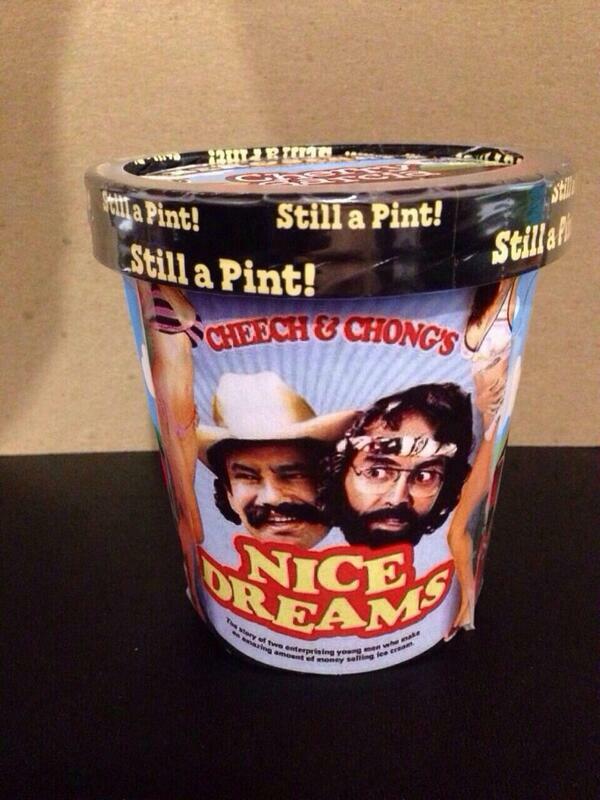 Follow Cheech and Chong's Nice Dreams Relaxation Ice Cream on Twitter @CheeChongCream. Media inquiries, please contact info@cheechandchongicecream.com. Shareholders, investors and potential new distributors are invited to be added to the corporate e-mail database for the future distribution of corporate press releases and industry updates by sending an e-mail to lcgroup@mindspring.com. BeBevCo. (Bebida Beverage Company) develops manufactures and markets liquid relaxation products including KOMA Unwind "Liquid Relaxation" (TM), KOMA Unwind Sugar-free "Liquid Relaxation" (TM) and KOMA Unwind "Liquid Relaxation" Shot (TM) as well as POTENCIA Energy, POTENCIA "BLAST" energy shot, Relax 5 shots and Piranha Water. Tommy Chong tells CelebStoner that Super Troopers Director Jay Chandrasekhar is working on a script for a new Cheech and Chong movie. "We've had some preliminary meetings. It looks really good. It looks really funny. It will be about us going to a festival called the Burning Joint. All sorts of shenanigans happen. It's going to be a lot of fun." If all goes well, shooting will begin this summer. Let's see if this actually happens. The last movie fell apart after Tommy Chong was wrongfully sent to prison. Tommy's wife, Shelby Chong insisted she be in the film. Meanwhile, Cheech put in the contract that Shelby not be anywhere on set. Then, New Line Cinema lost interest after the Director dropped off the project to work on the film Borat. It was a big mess. Fox News in Milwaukee sat down with Tommy Chong and ate some chili. Once again, Tommy talks about the origins of the Dave sketch. And as always, he says he and Cheech came up with the sketch. In reality, it was Dave (a member of the comedy troop at Tommy's club) and Tommy that created the sketch. 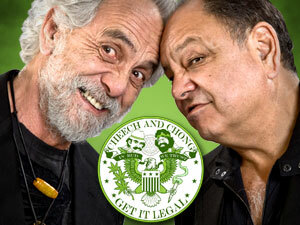 The Cheech and Chong Up in Smoke tour featuring WAR is coming back to the Greek Theatre in Los Angeles on May 24th. Cheech and Chong have a huge fan base in Cali. Tickets go on sale this Friday at 10AM local time via the links above. 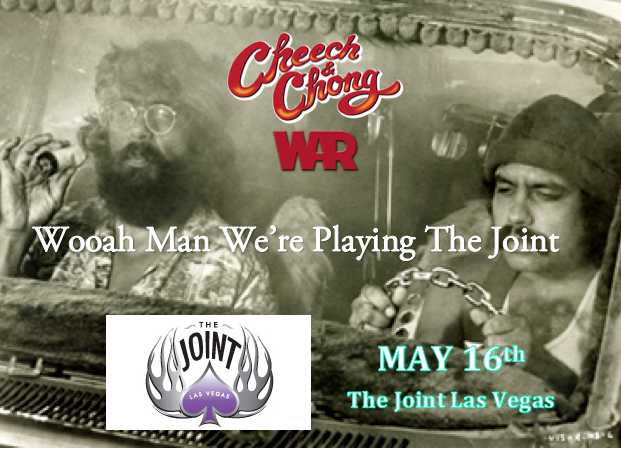 On May 16th, the Cheech and Chong Up in Smoke tour featuring WAR is coming to The Joint at the Hard Rock Hotel & Casino in Las Vegas, Nevada. Tickets go on sale this Friday at 10am local time via the link above. The Wolf of Wall Street, Jordan Belfort, sat down with the Hollywood Reporter to discuss serving time with Tommy Chong. When I arrived at Taft, they lost my paperwork, so I spent five days in solitary. It was brutal, absolutely brutal. But it was minimum security, and after solitary it was like a boys' club -- and who's my bunkmate? Tommy Chong from Cheech & Chong. I couldn't believe it. He was in the process of writing his book. We used to tell each other stories at night, and I had him rolling hysterically on the floor. The third night he goes, "You've got to write a book." So I started writing, and I knew it was bad. It was terrible. I was about to call it quits and then I went into the prison library and stumbled upon The Bonfire of the Vanities by Tom Wolfe, and I was like, "That's how I want to write!" When you're in jail, you have a lot of time to think about your mistakes. It was completely mellow. I played tennis three hours a day, and I'd write for maybe 12. I wrote about 130 pages, but I tore them up. I just didn't think they were good enough.